As was our aim at the beginning, we have always strived to promote a better understanding between China and all other nations. We have tried to represent China as she really is, neither what our ultra-patriotic people would like to make out of her, nor what the anti-Chinese foreign propagandists would have the outside world believe… . Being better acquainted with foreign institutions and foreign ideals, we feel it out duty to make them better understood by our compatriots, and at the same time re-evaluate our own institutions from the western point of view. Hence our criticism of our own civilization and culture… . The Critic may therefore be regarded as either nationalistic or internationalistic, because we strive to be both. And for Holland, sinology has a particular significance. The study of sinology has in the past been motivated by purely utilitarian considerations. The absence of that disinterested motive of scholarship is indeed a defect which it is one of the purposes of the Institute to remedy. 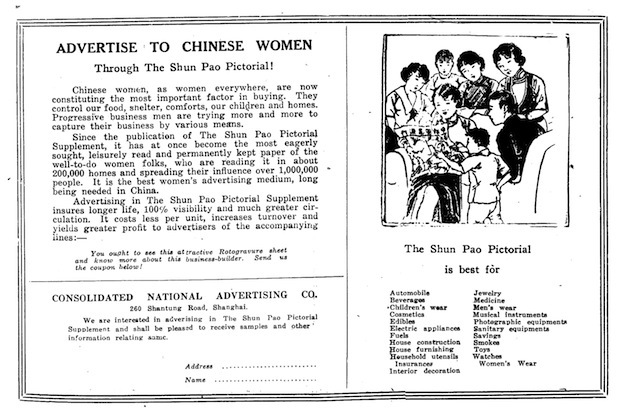 The writer of the Editorial praises the increasing interest in promoting sinology for 'purely scholarly' reasons. Because 'modern scholarship has become an international affair', he proposes that the new Dutch institute establish relations with Chinese centers of learning, notably the Academia Sinica. Cosmopolitanism has arrived whether we will or not. The radio, the aeroplane, the automobile and television are all bringing the world closer together… . This cosmopolitanism, I am afraid, is a one-legged development. Material cosmopolitanism is so far largely a rich man's cosmopolitanism. But whether it be rich man's or poor man's cosmopolitanism, there is urgent need of a corresponding growth of the liberal attitude of mind, and a more intelligently guided control of the surviving savage herd instinct… . There is therefore a great need for our consciously inculcating this new attitude of mind and thus meeting our evident discrepancy between our material conquests and our mental equipments. Having declared on 30 April that the popular column 'Little Critic' would be suspended during Lin Yutang's absence at the League of Nations, this week it is announced that T.K. Chuan 全增嘏 will assume editorship of the column. Henceforth, 'Little Critic' is largely in the hands of Chuan and other contributors. Let Mrs. Buck's article be a perpetual warning for all of us, including us of the Critic, so that snobbishness may be forever banished from this land and a broader, larger understanding may come to us through a sympathetic contact with the unfortunate, the unknown, and the unhappy. Almost six months ago we found occasion to warn the public of the imminent danger in Manchuria. Unfortunately our prediction has come to pass. In presenting this special issue we have been guided by the principle that truth speaks louder than propaganda. 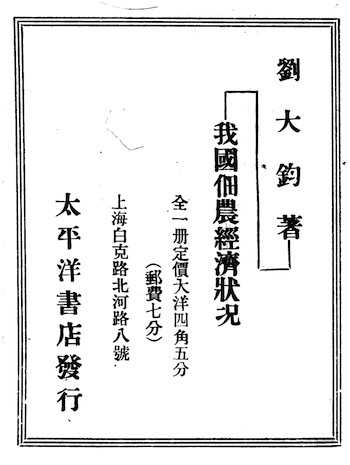 The following pages contain undisputable facts which, in our belief, would assist the public in understanding the present crisis so dramatically precipitated by Japan's invasion of Manchuria—The Editors. 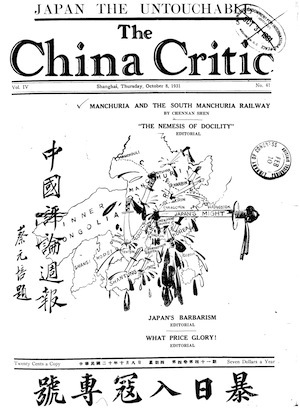 Beginning with this issue, The China Critic published only 'Editorials' and 'Special Articles', with reportage until early 1932 focusing overwhelming on Japanese affairs. Other columns, such as 'Women's World', 'Little Critic' and 'Book Review', are suspended until mid-December. The 'Little Critic' and 'Book Review' columns resume this week, and the 'Women's World' column the following week. 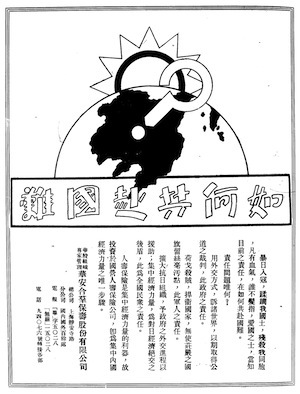 This issue also carries an obituary for Xu Zhimo 徐志摩, 'The Death of a Poet'.